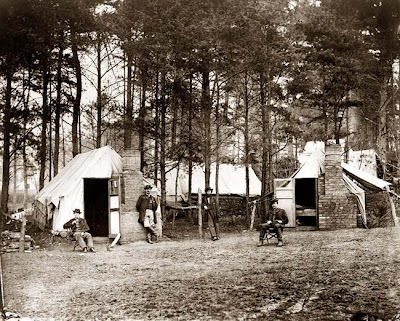 In the last days of the last week of the Civil War, there was a camp on the outskirts of Raleigh used at various times by all three wings of Sherman's massive, invading army of 90,000 Federal soldiers. 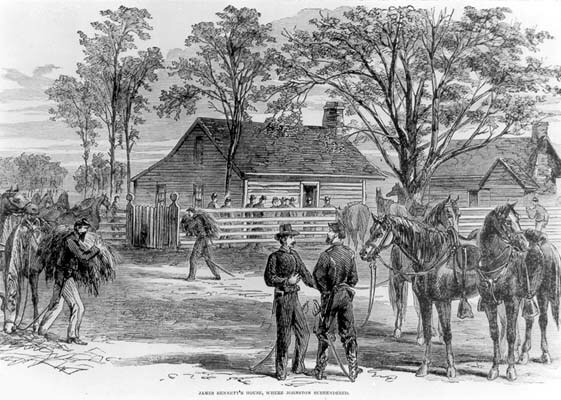 This particular encampment was on high, rolling ground, overlooking a picturesque farm that featured a beautiful water source, and was bordered by key roadways that allowed easy passage to and from the newly captured city of Raleigh and Hillsboro, to the west, where Johnston's army (including Wade Hampton) had fled. 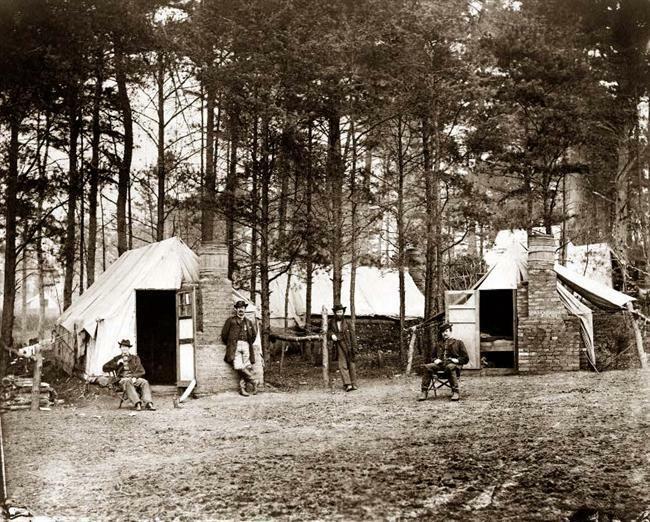 Today, the site where tens of thousands of soldiers lived in April 1865 is an office park. The ancient trees, silent witness to such fantastic events of the past, are gone. The rolling hills have been graded and reshaped by bulldozers, the lake drained. 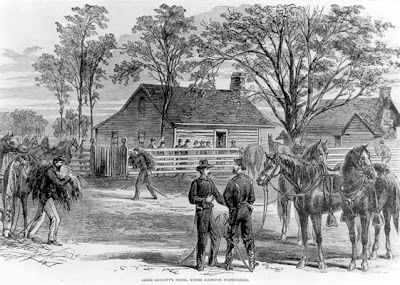 Driving by, you would never imagine that the bland office buildings, parking lots, and warehouses were once home to the full might of the largest military organization in the world circa 1865. In a site so thoroughly developed, it's practically impossible to gain a visual sense of its past. However, the troops who were here did leave their mark, it's just hidden below the surface. With landowner permission, I was able to metal detect the "Forgotten Campgrounds" several times over the summer of 2012. I approached the site with great skepticism, but gradually started finding a bullet here, a piece of camp lead there. And before long, standard .58 caliber three ringers with a thick brown patina began to emerge in quantity. I'd find them in the craziest places. One concentrated area, just a few feet from a modern road and freshly laid sidewalk, yielded over 24 bullets. This section of the site was comprised of fill dirt. It had been pushed or dumped in this location from another area of the site but it was full of Civil War bullets. Eventually, we found a tiny patch of original land, an island from the past in the middle of all the asphalt and glass. It had some hardwood trees growing on it but was mainly covered by dense, secondary-growth pine. The ground was covered with several inches of pine straw but still visible were the plow furrows from forty years ago when the region was last farmed. In this vestigial grove, we found bullets, camp lead, carved lead, knapsack grommets and, occasionally, something that hinted at the full martial glory of the past. Camp lead, cleaner base, bullets, misc brass, found at the "Forgotten Campgrounds"
Eagle "I" Button from the "Forgotten Camp"
Everything was 9-14" deep and there were thousands of iron nails from an abundance of discarded supply crates. It was hard work just to find a good signal. After a few weeks, I had saved what I could. I put my equipment in the back of the truck and looked out over the office park, trying to envision all of those soldiers, horses, wagons, and tents crammed into this area as far as the eye could see. I'm grateful to have been able to rescue what I did. But who knows what the bulldozers have buried forever? This post is gratefully dedicated to Dan Frezza for his profound knowledge, enthusiasm, and generous support.